A SHINING STAR IN IRISH MUSIC CIRCLES, the acclaimed Mary Black has eleven platinum-selling albums to her credit that have spawned countless international hits. Mary has shared stages, television shows and recording studios with some of the most revered performers of her time and is, understandably, widely regarded as one of the most important vocalists of her generation. Building on her reputation as playing a pivotal role in bringing both traditional and modern Irish music to an increasingly appreciative and ever-growing global audience, Mary has excelled herself with the highly-anticipated new studio album Stories From The Steeples. With reflections of Mary's strong historical commitment to original material by home-grown Irish songwriters, Stories From The Steeples is well-crafted around stunning tracks such as the folk ballad Marguerite And The Gambler and is a joy to listen to. The gorgeous Steady Breathing has the feel of a lullaby and the amazing Walking With My Love, where Mary's rich, beautiful tones meld delightfully with the gravelly voice of Finbar Furey, is a terrific track that is jaunty and uplifting. Three songs are featured from up-and-coming young songwriter Danny O'Reilly, as well as interpretations of songs by Eric Bogle  the anti-war All The Fine Young Men  and Ry Cavanaugh's Lighthouse Light, performed finely with wonderful harmonies by Mary with her long-time friend Janis Ian. The very poignant All The Fine Young Men shows the futility of war; the promises made and broken and the loss of young lives. Mary sings with great control, yet her voice oozes empathy. This song is a reminder that, lest we forget, we owe a great debt to those who lost their lives fighting for their country. Mary has previously performed with Emmylou Harris, Joan Baez, Mary Chapin Carpenter and Van Morrison and her new album also includes three collaborations with new artistes. Stories From The Steeples benefits from the gutsy Mountains To The Sea and Mary was "thrilled to get to sing alongside one of my favourite singers, Imelda May". Of her collaboration with Finbar on Walking With My Love she says it's "a song that always makes me smile" and it was donated to a special EP for the Alzheimer Caf� initiative. The album's collection of emotive songs is pleasing. In an industry famed for its fickleness and its insatiable need for fresh novelty, Mary's enduring success is testament to her great talent and her love of singing. It is a tribute to her gift that her work truly does transcend generations as well as national and musical boundaries. The album is a collection of notable tracks. The lovely melodies of One True Place linger on; and who could ever forget the cute 'extra' of Fifi The Flea! Mary gives of her best and her best is more than good enough. 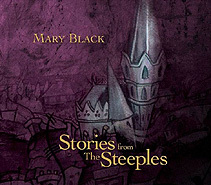 Mary Black's superb new album Stories From The Steeples is released on Blix Street Records on 9 January 2012. Tracklisting  1 Marguerite And The Gambler | 2 The Night Was Dark And Deep | 3 Mountains To The Sea (with Imelda May) | 4 Faith In Fate | 5 Steady Breathing | 6 Walking With My Love (with Finbar Furey) | 7 All The Fine Young Men | 8 The Night Is On Our Side | 9 Lighthouse Light (with Janis Ian) | 10 Wizard Of Oz |11 One True Place. Bonus Black: Fifi The Flea.